KONG Puppy Teething Stick is specially designed to help puppies in the chewing and teething period. The patented Denta-Ridges also help reduce plaque. KONG's Puppy Teething Stick is ideal for your growing puppy and made of patented Denta-Ridges. 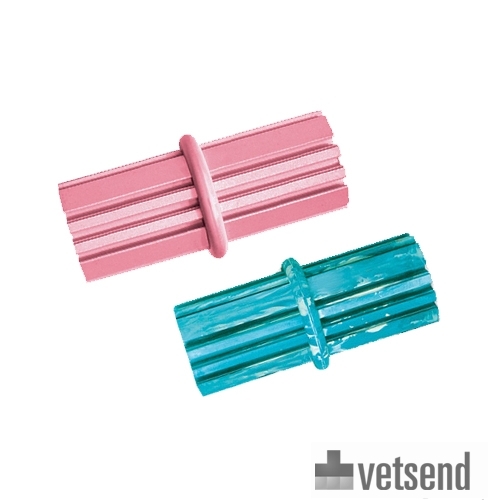 These gently clean your puppy's teeth and promote healthy gums. Regular use of the Puppy Teething Stick may prevent dental problems in your dog. You may choose to use dog toothpaste or KONG Stuff'N Puppy Easy Treat between the ridges for an even more enjoyable experience. Available in various sizes and in pink or blue. KONG Puppy Teething Stick - Small (approx. 3 x 8.5 cm) Suitable for dogs up to 9 kg. KONG Puppy Teething Stick - Medium (approx. 3.5 x 9 cm) Suitable for dogs from 9 to 16 kg. Have you used KONG Puppy Teething Stick before? Let us know what you think about this product.